Tassana Pra's freeform ocean view swimming pool fills most of the front garden and is bordered by a tiled sun terrace with loungers for tanning and repose. The views right from the water are nothing short of breathtaking, the entire area framed by flowering plants and a pleasant lawn. To the left of the main house the garden extends across a second, wide lawn with a swing placed below the trees for shaded reading and contemplation. 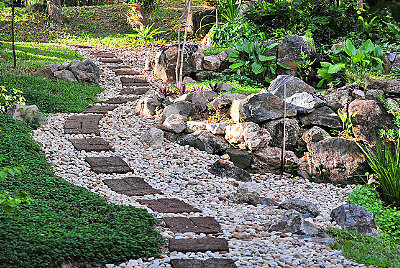 Stone steps lead down into a beautifully landscaped gully, where a Thai sala sits by the lily pond, providing an almost literary retreat, surrounded by nature's gifts. Tassana Pra sits high on a cliffside overlooking Big Buddha Beach and the village of Bang Rak - one of the island's quieter stretches of sand, but also the main departure point for boats to Samui's sister islands of Koh Phangan and Koh Tao. 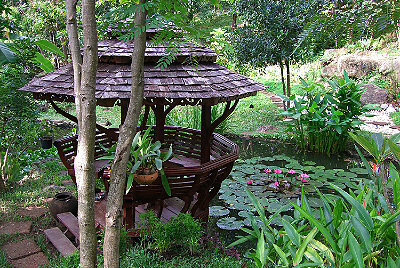 The villa is reached via a steep, winding road that climbs from another small village, Plai Laem. 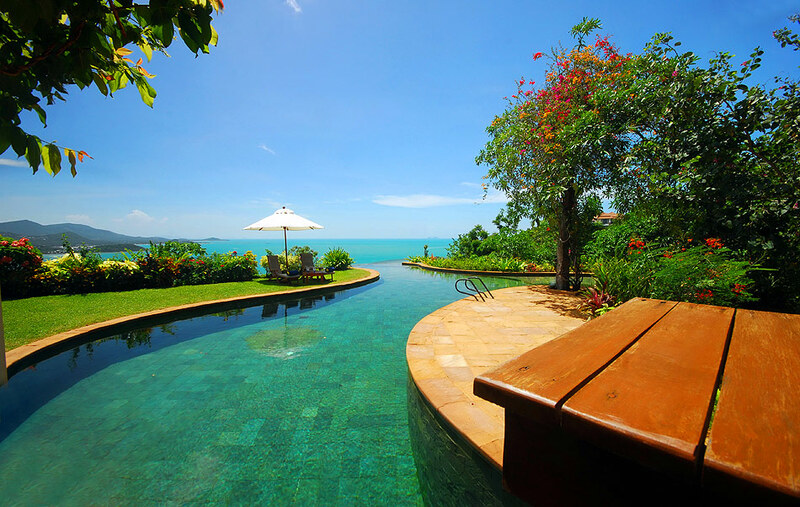 Just 10 minutes drive from Samui's International airport, the location couldn't be more convenient. Yet despite the villa's proximity to a range of resorts, restaurants, bars, shops and transport options, the hillside location means you feel pleasantly removed from the melee. To the west of Big Buddha beach, around 4 km from Tassana Pra, Bophut Fisherman's Village is one of the island's most appealing beachside villages where original wooden shop houses line a small lane, many of them converted into pleasant restaurants serving cuisine from around the globe. Heading north-east from the villa takes you to Choeng Mon, a popular beach lined with upscale resorts and quaint dining options, while a few kilometres further on are the bright lights and bustle of Chaweng, the island's busiest tourist centre. 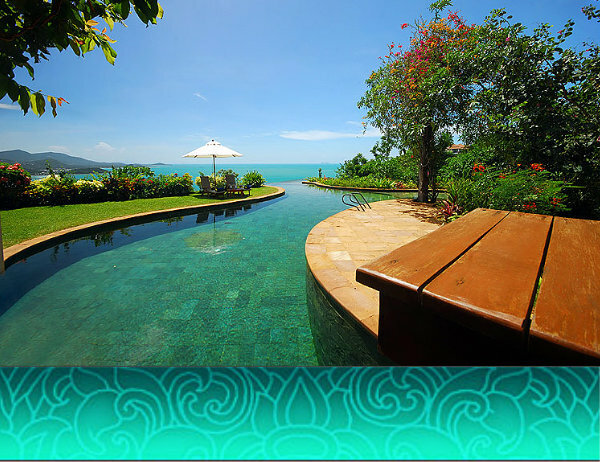 It's this combination of heritage beauty, luxury, peace and easy access to Samui's best tourist amenities that makes Tassana Pra one of the most desirable residences on the island. Easy access to the airport, plus ferry piers to neighbouring islands make Big Buddha beach a popular spot for those wishing to explore Samui's offshore islands. 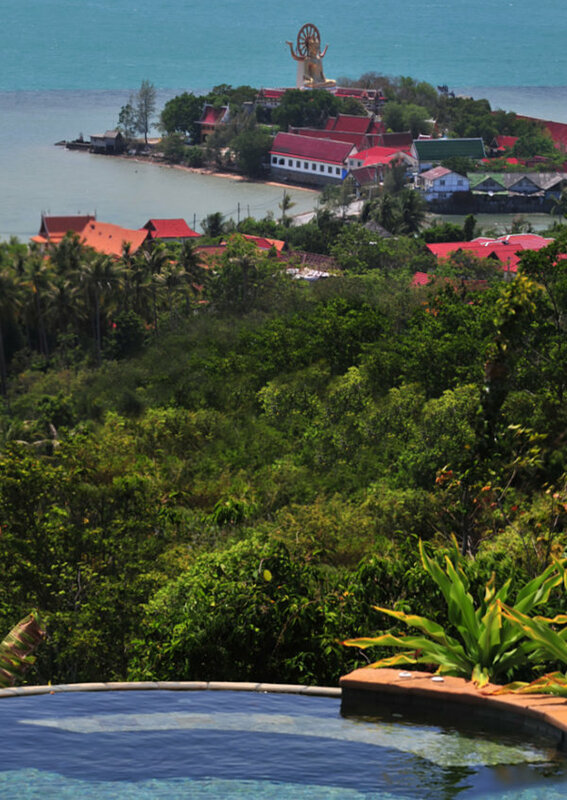 Bang Rak village has its own appeal with hotels, bungalows, restaurants and bars catering to both short and long-stay visitors. A 3 km stretch of road sees local village life blending with tourist amenities. The temple at Wat Phra Yai is home to the 12 m Big Buddha statue, Samui’s most famous landmark and a must visit. At the base of the temple, shops and restaurants cater to the needs of devotees and tourists alike. The piers at Bang Rak are a popular starting point for speedboat trips to Koh Phangan, Koh Tao and Ang Thong National Marine Park, with diving and snorkelling companies offering trips to a range of excellent underwater sites in the Thai Gulf. Other nearby locations offer a diverse choice of activities to suit a range of tastes and interests. The village behind the villa, Plai Laem, boasts an impressive modern temple complex with huge Buddha statues and friezes on the temple walls. Beyond that, Choeng Mon and Chaweng both offer water sports options from the beach, including sailing and jet-ski rentals, while for shopping, Chaweng is undoubtedly Samui's top location. The 5 km beach strip has everything from street stalls selling souvenirs to upscale boutiques and an international supermarket, which stocks quality imported food and drink. Land based tours and adventures include nature trips to waterfalls and viewpoints, plus monkey and crocodile shows for the children, as well as elephant and canopy rides in the jungle and ATV safaris. There are also two top quality golf courses on the island. 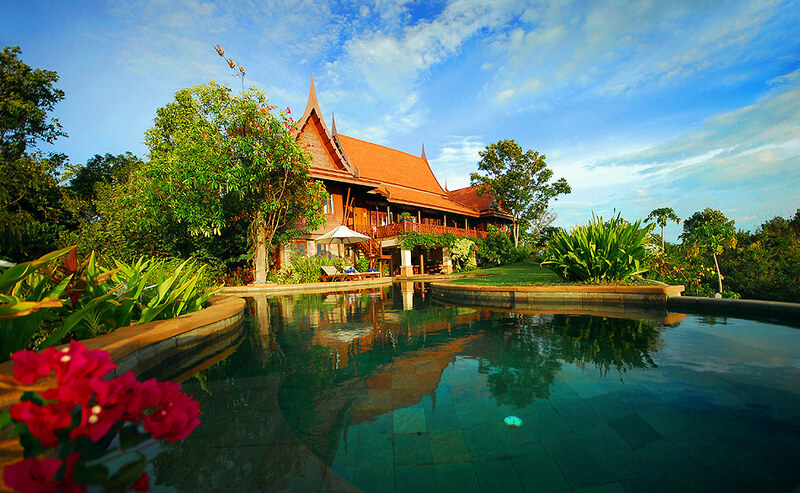 Khun Oy, the Villa Manager will happily provide details and book tours and trips for guests at the villa. Such loverly views. We had a great holiday and were looked after by the staff very well. Fabulous.